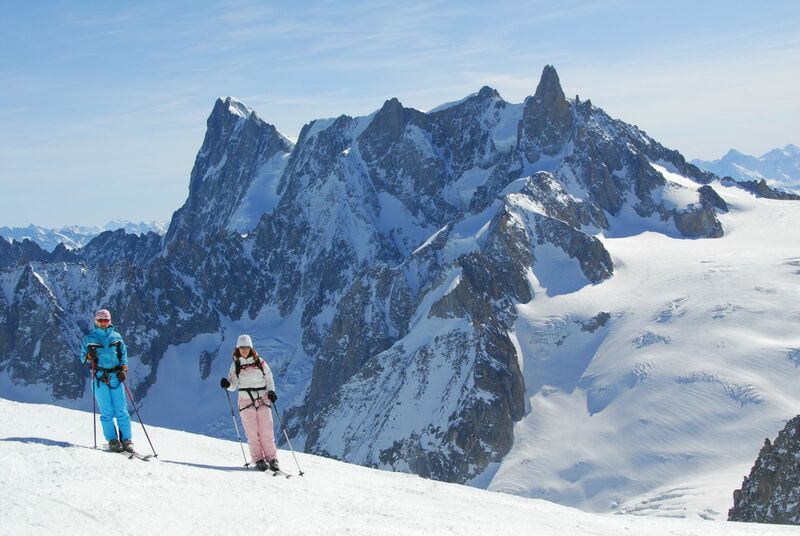 Who has not dreamed of skiing the Vallée Blanche? The crowning moment of a ski holiday in Chamonix, the Vallée Blanche is one of the world's most beautiful off-piste runs and the world's longest ski descent from a single lift - the Aiguille du Midi cable car. A glorius descent through breathtaking landscapes in a high mountain atmosphere accompagnied by our UIAGM certified high mountain guide. 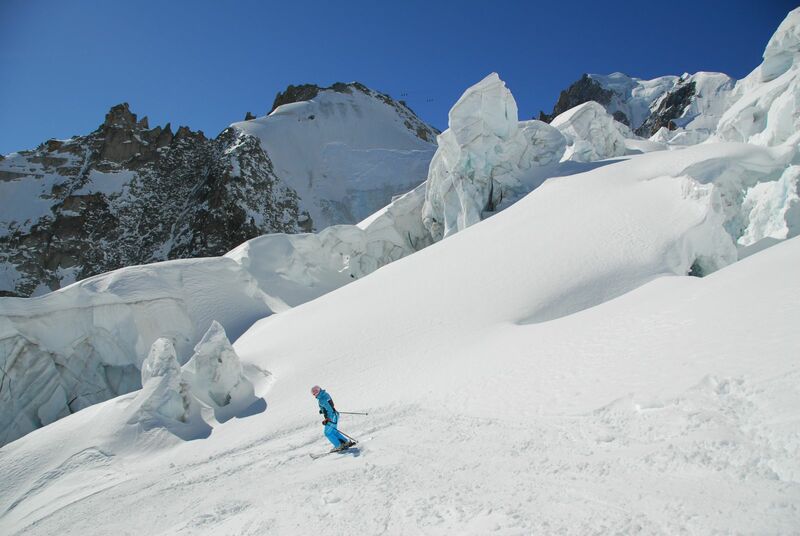 There are many different ways to ski down the Vallée Blanche, depending on your ski level and experience. Skiers must not underestimate the alpine character, weather conditions, and particulary be aware of its particularity and potential danger (crevasses, avalanches). Our Chamonix Mont Blanc Guides have the knowledge and experience as well as a developped eye to choose the safest route over the glacier. The Vallee Blanche routes start at the top of the Aiguille du Midi (3812m) where after exiting the ice tunnel you are straight onto the ‘arête’. This is potentially one of the most dangerous points of the route as it is essentially a ridge edge which has a 50-degree pitch on both sides. In high season, a safety rope is placed along the descending path. Your guide will rope you and if necessary depending on the season you might need the use of the crampons. 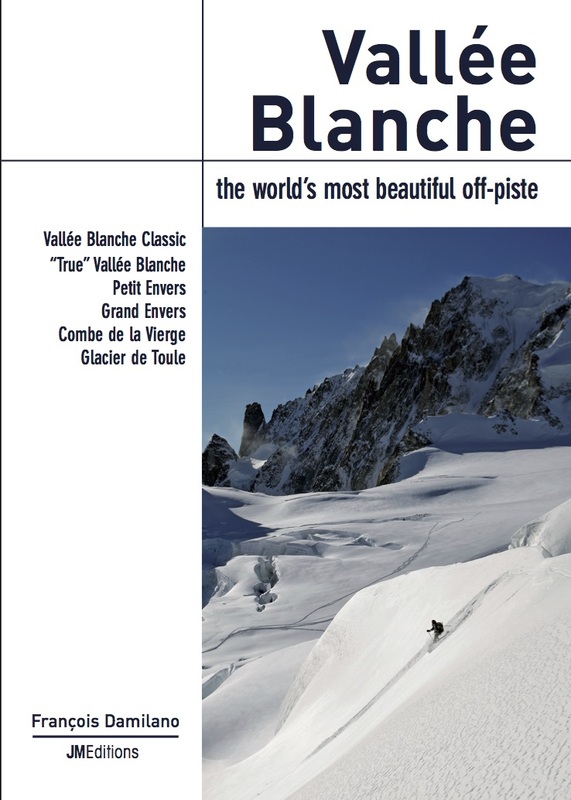 There are four main Vallee Blanche routes. The classic route ‘voie normal’ is fairly straight-forward. The other routes are known as Le Vrai Vallee Blanche, the Petit Envers du Plan and the Grand Envers du Plan. These are technically more challenging and involve couloir skiing so are for more experienced skiers. Your certified UIAGM guide will decide which route down you'll ski depending on your ski level and experience. The conditions of the Vallée Blanche and level required depends on the actual weather and snow conditions. It can be deep powder or as well as tamped down by the passage of numerous skiers. Along the descending route you will see large séracs, crevasses and ice falls which are pretty impressive sparkling away in various shades of icy blue from the winter sunshine. If you allow for regular breaks and a bit of sightseeing on the way down you will probably take between 4 and 6 hours for the round trip from Chamonix. 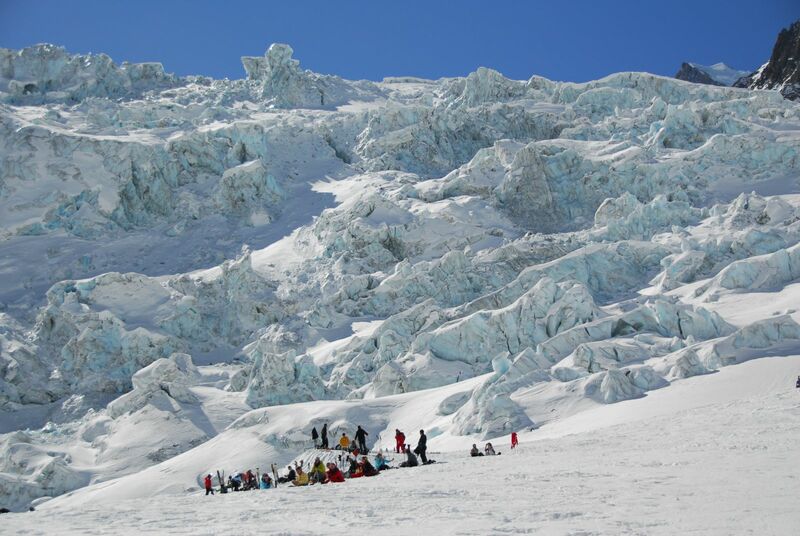 A popular pit stop for lunch on the Vallée Blanche is the Requin refuge. You can also do a lunch stop at the ‘Salle a Manger’ beneath the séracs and admire the large ice structures from safety distance as they can collapse at any time. The route at the end of the Vallee Blanche really favours skiers as it has a long flat run out which can be tricky for snowboarders to keep moving. During the spring it gets pretty slushy too so it is recommended that snowboarders take a pair of poles to push themselves along. In good snow conditions you can ski all the way back to Chamonix’s town centre; if not then the best way down is via the gondola and the famous cogwheel Montenvers train. 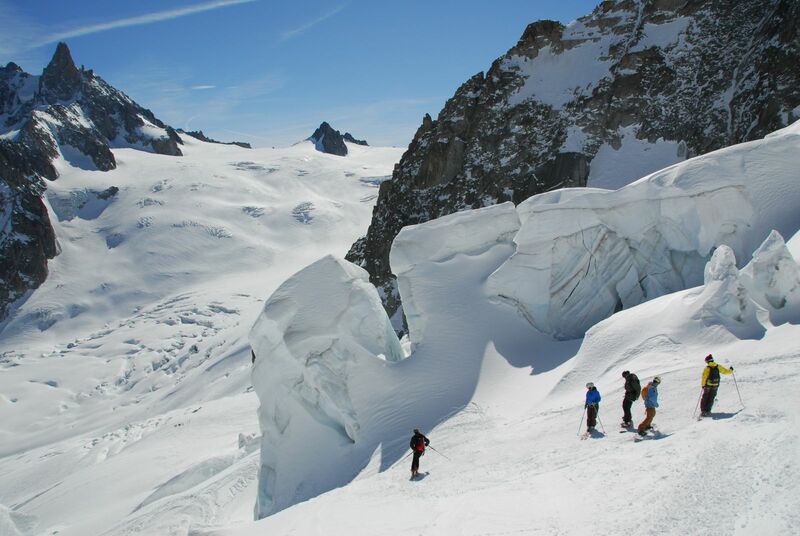 The "classic" route is the easiest and most popular way of skiing the Vallée Blanche. Through all way down, following mostly gentle slopes through the enourmous snowfields of the Glacier du Géant, you will discover the granitic obelisks of the Grand Capucin, the pillar Gervasutti. A break at the refuge Requin will allow you to taste a specialty of the country and to let you go to the contemplation facing these grandiose landscapes of high mountain, while taking again some forces. This route can be enjoyed by any competent skier. It is the least traveled route, passing on the left of the "Gros Rognon", and taking a secret combe quite difficult to access.The route winds its way through impressive crevasses and seracs, often offering a dreamy powder thanks to its full north orientation. This route requires a very good level of skiing in all snow. Descending through a formidable maze of crevasses and seracs, the slopes are never too steepbut the skiing is quite sustained and requires very good skiing skills. A faboulous descent through spectacular glacial terrain, in the background having an open view on the Talèfre glacier, the Grandes Jorasses, and La Dent du Géant, a festival for the eyes! This route is only for good and experienced skiers. Technically demanding descent that should only be undertaken by excellent skiers with experience of high mountain terrain. With continuously steep skiing and narrow passages between icefalls,c crevasses and rimaye, it is a magnificient but very challenging route; all the ingredients are gathered for maximum thrills, always in the heart of an exceptional high mountain setting. This route it is the route with a big I, reserved for excellent skiers. After reaching the foot of Adolphe Rey Point by the classic route, we will put synthetic skins under our skis and we will go up through the seracs of the glacier towards the Col d'Entrève, on the ridge border with Italy. The Italian and French panorama will extend as far as the eye can see with mountains to infinity. Departure for the valley of the Virgin on the right bank of the glacier for a superb descent often in powder. We will continue on the right bank, a much less busy and more beautiful route, to reach the "Salle à Manger" under the refuge du Requin where we will join the classic descent. This route is for good to very good skiers, skinning experience required. Is the Vallée Blanche difficult? Skiers wishing to descend the classic route must be capable of skiing red runs. In order to enjoy the descent safely, you must be able to turn at will and control their speed, even in changeable snow conditions. You must be able to slideslip confidentaly and under control. 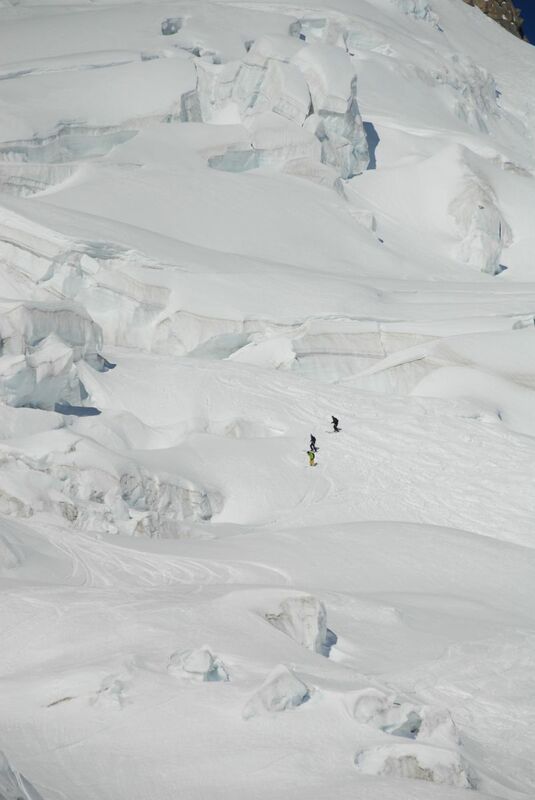 The Vallée Blanche presents difficulties and dangers: high starting altitude, ungroomed snow, crevasses. It is importany to remain vigilant throughout the descent. The presence of a guide is necessary because you are in glacial terrain of high mountains and therefore insecure. Can I bring my children there? It is possible from 10 years, if they have an ESF arrow or chamois level. Moreover, they must be really sporty and tonic. Do not hesitate to call us to have a chat with our guides in order to be sure fo their level..
Every day, from Christmas to early May, depending on the snow conditions. We postpone the activity. What you paid is converted into a down payment for a later date. In case of closure of the Aiguille du Midi cable car your guide will propose to do it from the Italian side (tunnel or bus extra fees, identity card required to cross the tunnel) or you can enjoy a day off-piste in a other sector. The commitment will not be voidable in this case. Discover more about the Vallée Blanche through the book of François Damilano : Vallée Blanche available @JMEditions. Credit photos and describing text taken from his book. The Vallée Blanche can be done from end December beginning of January until mid April, depending snow conditions.